Fuzzy fun on the farm! Open the fuzzy pages and stick the felt animals down to make all kinds of fluffy farmyard scenes! Starting first thing in the morning and ending at night, this book tells a simple story of a day on the farm, which children can illustrate with their own fuzzy pieces, letting their imaginations roam. Cows go to be milked, a cheeky cat chases chickens, and sheep huddle under a tree. 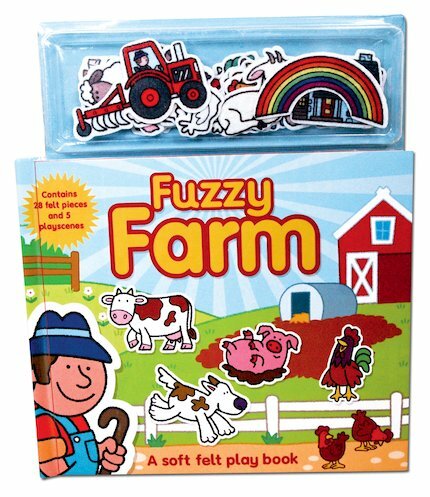 With cows, sheep, ducks, rainbows and many more felt pieces to stick in, this book of farmyard fun is perfect for creative play. Contents: 10-page board book with 5 fuzzy play scenes and 28 felt pieces.